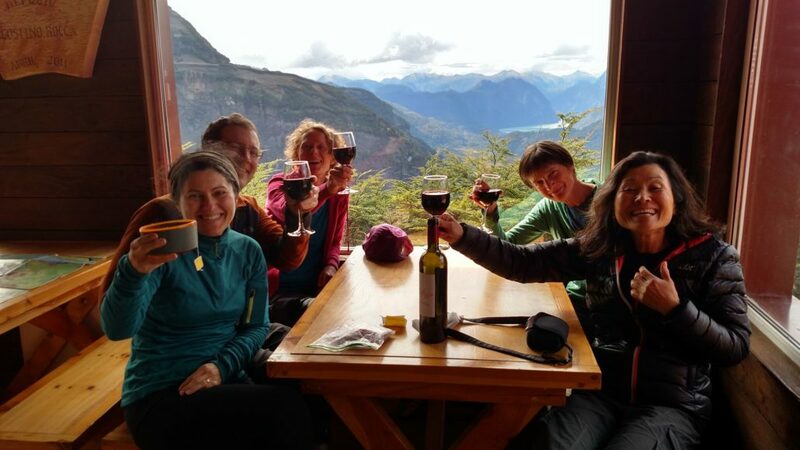 Our clients at Andescross are of all ages and range from couples on their honeymoon, families, groups of friends, and lone travelers looking to experience the best Patagonia has to offer. We are happy that most of our clients return to Patagonia for another trip with us, or we meet them in a different part of the world for a new adventure! Because all of our guides speak Spanish and English as well as some of our guides also being fluent in French, Italian, and American Sign Language, most of our clients come from Canada, the United States, Europe, and Argentina. Check us out on Trip Advisor, or we have many previous clients who would gladly offer their counsel and we can put you directly in contact with someone who has done the trip you are interested in. Here some of their genuine comments, some are almost love letters!!! 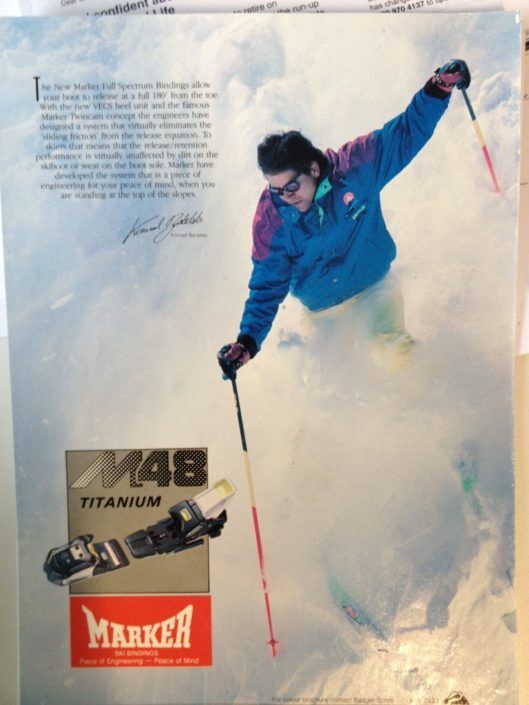 “40 years ago I flew down to Argentina in my summer for downhill training in the Andes. I was then racing on the World Cup circuit and so having 4 weeks on snow in summer was really useful training. I fell in love with Bariloche and returned the next year again. Sadly this was the last time I made to South America and then, when skiing in Iceland, I bumped into a friend of our guide, John Falkiner. We shared a few beers waiting for our airplane to fly home and John explained that his friend, Jorge, was a guide down in Argentina and that helped in Bariloche. “About 10 years ago I contacted Jorge about doing a hut to hut ski trip in the mountains around Bariloche. I chose him because he was a fully certified International Mountain guide. This trip proved to be nothing short of fantastic. Jorge was professional, friendly, knowledgeable of the area we were traveling through and was a great travel partner. He took care of my travel arrangements in Bariloche, booked my room for me before and after the trip, and even picked me up at the airport. The next year, I returned for a volcano ski trip with Jorge. We were fortunate enough to ski from the summit of four volcanoes. In the last decade, I have traveled with him at least 8 times. We have skied in Chile and Argentina numerous times, including a trip to the Patagonian Ice-fields. As part of his group to Iceland, we skied runs that took us down to the ocean. 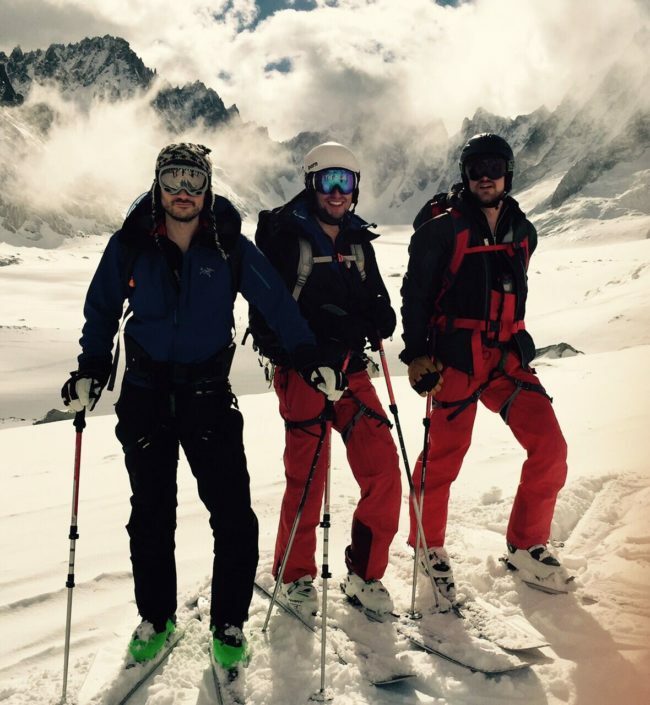 A few years ago, we skied the Vallee Blanche near Chamonix, France. Jorge and I have a trip scheduled for the Alps this spring. Jorge’s greatest strength is that he is extremely safety conscience and does everything possible to ensure that his clients stay out of harms way. 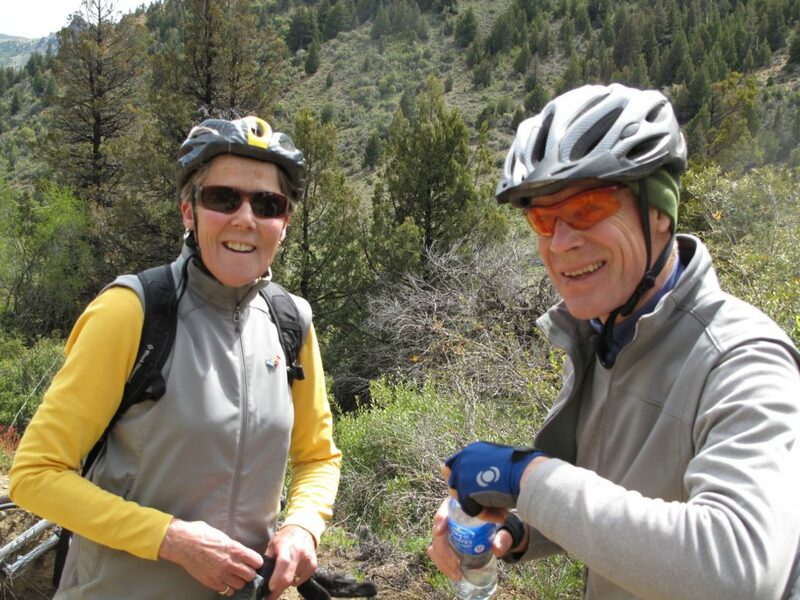 He is patient and assists clients, ensuring that they are warm, comfortable, and well fed in the mountains. I have even seen him take on the role as referee when clients started bickering among themselves, sometimes going beyond what I felt the clients deserved. He keeps his clients calm when they feel out of their comfort zone and shows them that they can accomplish more than they thought possible. I have not seen any weaknesses from him in managing groups in the mountains. This is what he is trained to do. He has a great sense of humor, enjoys being with clients and is a good guitar player”. “Back in 2006 I decided I wanted to try backcountry skiing and soon after I ended up contacting Jorgito at Andescross, which was already a very respected guiding company in Argentina. The idea of climbing all the mountains and volcanos in patagonia in the winter time and skiing them on the way down sounded too good to be true. Our first trip with Andescross was to Frey Hut with a couple of my brothers. The skiing conditions were as bad as Patagonia can offer so we ended up 2 days stuck in the hut in the midle of a storm and one day skiing on pure ice… Still, being there in such a remote and beautiful place , shearing the time with such passionated, fun and crazy people was enough to have me coming back for more than 10 years now. 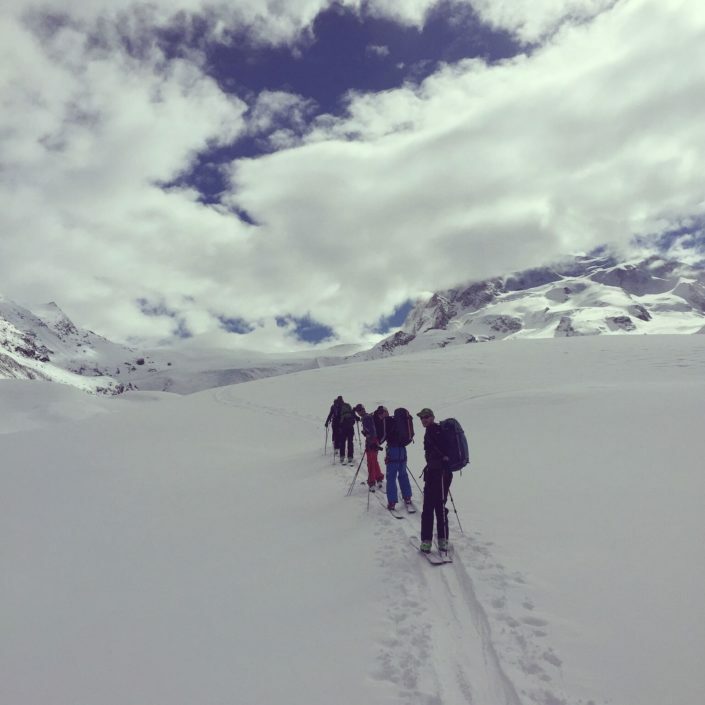 In this period we have climbed and skied the most amazing mountains in the Bariloche area, most Chilean Volcanos, Chalten area and this year we had a fantastic trip to Chamonix in France. We probably have a wish list of places to go to that would require we ski up to our 70′ at least. 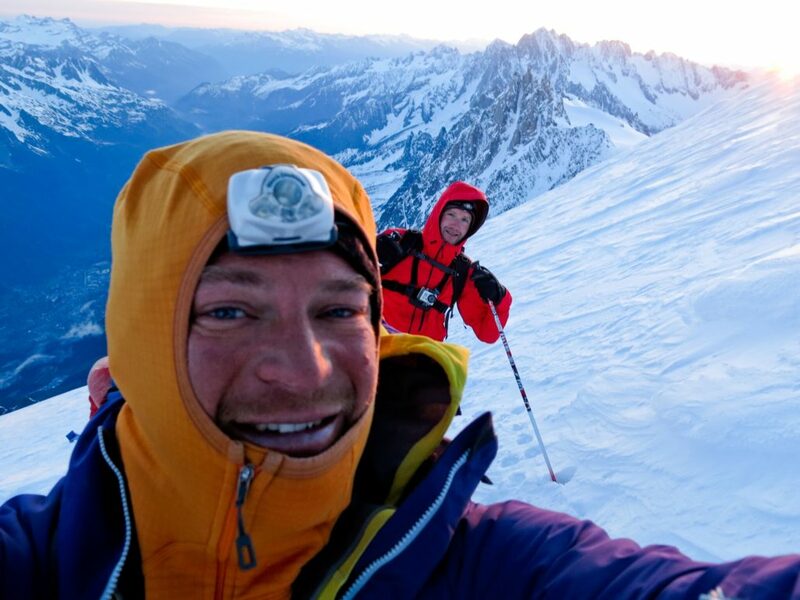 “I have skied with Jorge and Andescross in the Andes and the Alps in Europe. Simply put, the Andes Mountain range is Jorge’s backyard and he knows then well. In my view, I think it would be very difficult to find another South American based guide with comparable years of experience in the Andes, guiding credentials, and local knowledge. Over the years, Jorge has gained significant knowledge of the Alps and many other mountain ranges in the world which he includes in his worldwide adventure trips. He is able to quickly gauge conditions, make safe decisions, and find great untracked skiing. 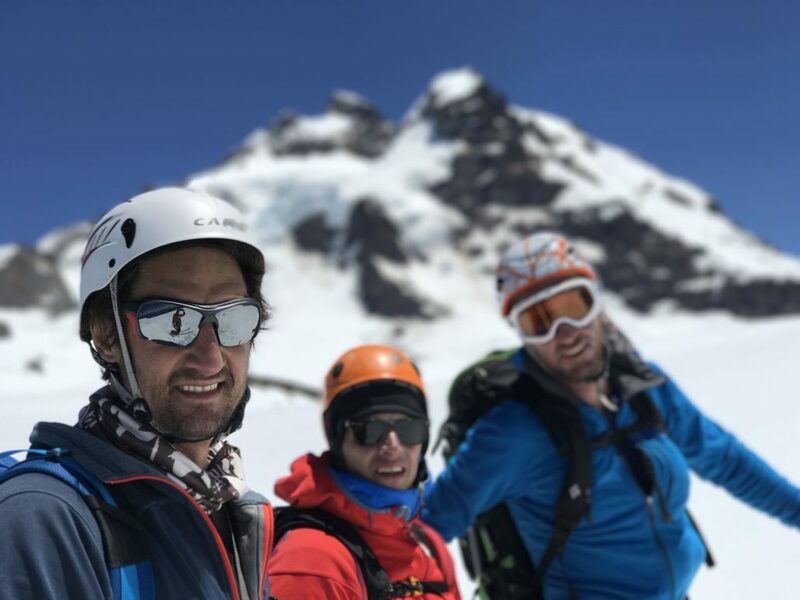 While mountaineering and backcountry skiing is a highly technical and potentially dangerous activity, Jorge’s vast knowledge significantly mitigates risks, making days relatively safe and most importantly fun and engaging. While focus on safety, teaching needed skills, and providing helpful feedback is critical, Jorge adds a lot more with his knowledge of the sport, local culture, and enthusiasm. Andescross goes beyond just providing a guide for the day, but builds lasting relationships and provides adventures that create memories to last a lifetime. 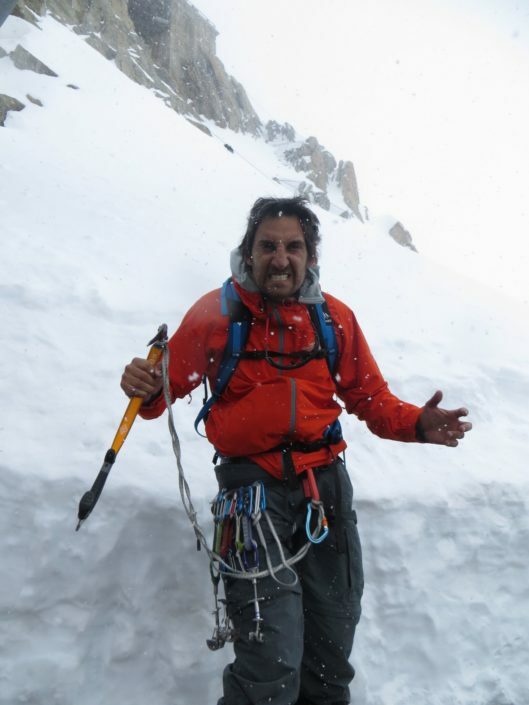 Jorge is a true international mountain guide with professionalism, experience, knowledge and his passion is sincere because he love skiing/climbing and thoroughly enjoys working with his clients”. “In just over a six year period, we have done five trips with Jorge and have committed to a sixth next year. We must like this guy! Jorge is THE guide for your Patagonia adventures…and beyond! 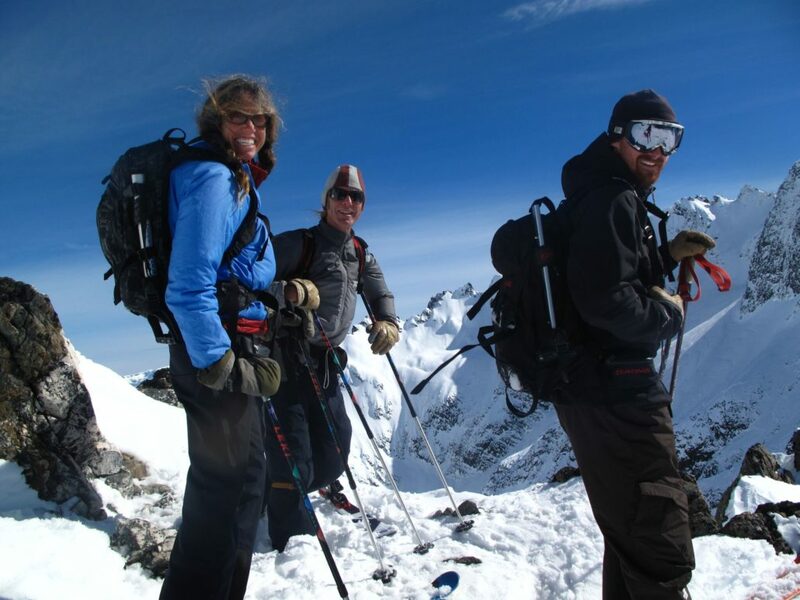 Our first trip with Jorge in 2010 was for backcountry skiing around Bariloche, Argentina. While we were temporarily weathered out of higher terrain due to high avalanche danger from tons of new snow, we never lacked for fun, challenging, and noteworthy alternatives. He shared with us his hometown stashes, something only a generous local guide could do. In 2011 we skied Antarctica with Jorge. A trip of a lifetime to be sure. Jorge himself had guided there previously so he was extremely knowledgeable about what to expect. He shares our love of skiing and adventure. We were typically the first zodiac out in the morning and the last to come in. If you ski one place, why not watch killer whales from the skin track and or have a standing audience of penguins as you ski down to the water. 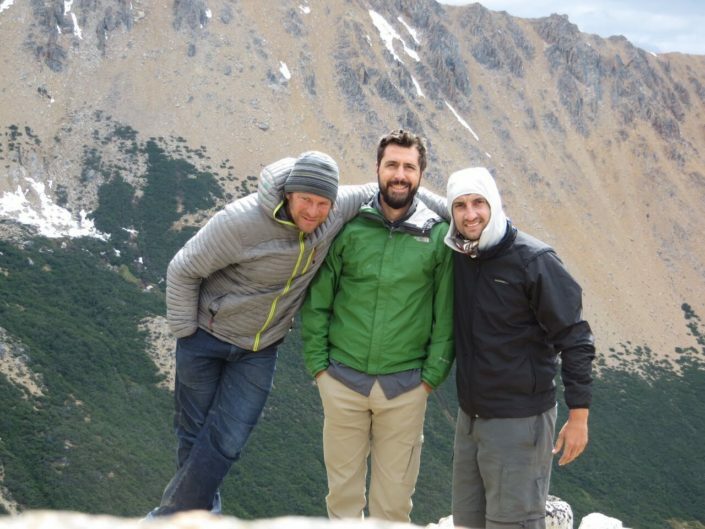 In 2012, we asked Jorge if he could customize a trip to Fitz Roy, based out of El Chalten. 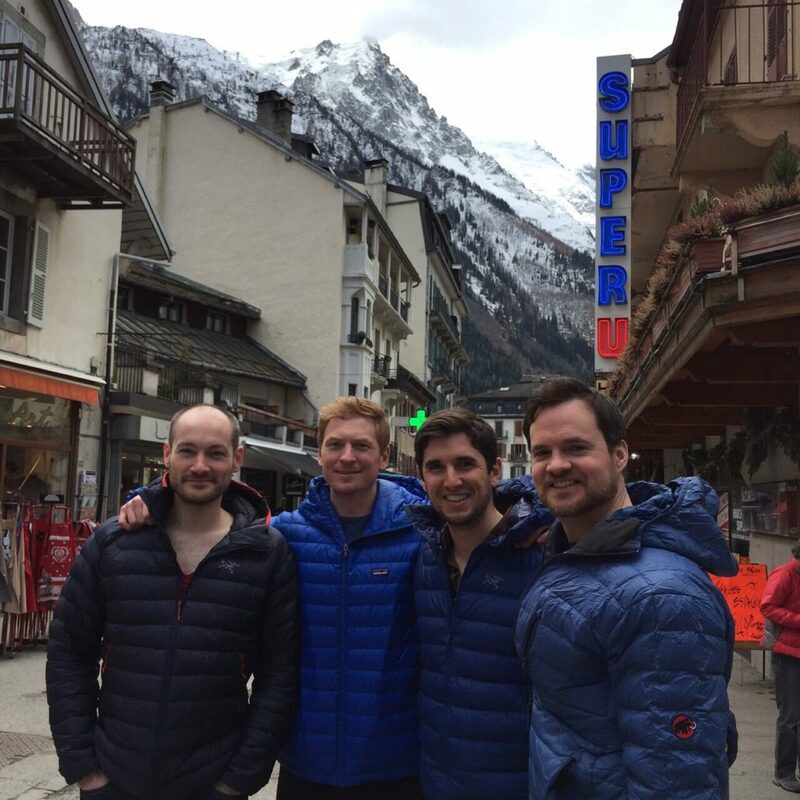 To ski in the shadow of the Fitz Roy massif had been an idea of ours for a few years. 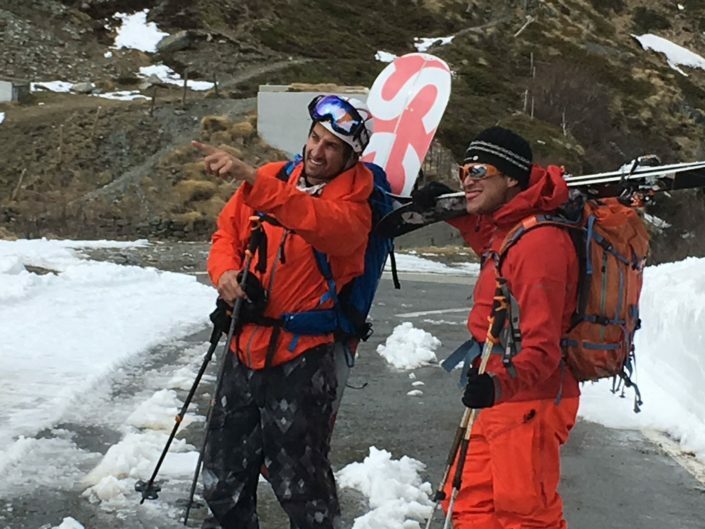 Again, Jorge’s local Patagonia knowledge, his strong relationships with proprietors, and his eye for worthy ski objectives combined for a seamless and memorable experience. In 2014, we joined Jorge in Iceland. 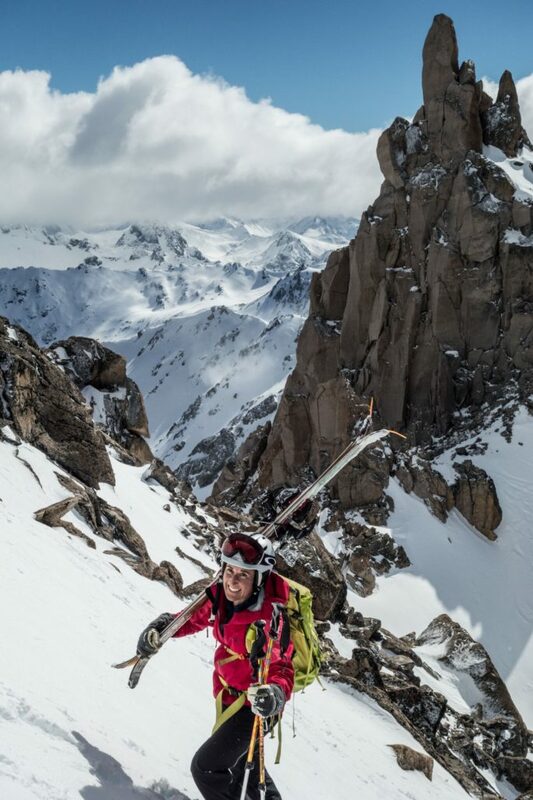 Jorge’s ski mountaineering knowledge extends well beyond Patagonia! Iceland has a great diversity of ski options, great summits from the car with descents down to the ocean and long hours of daylight for extended or multiple objectives. As we were joined with another guide and clients, Jorge easily worked twice as hard to ensure each and every client was satisfied with the trip meeting their expectations. 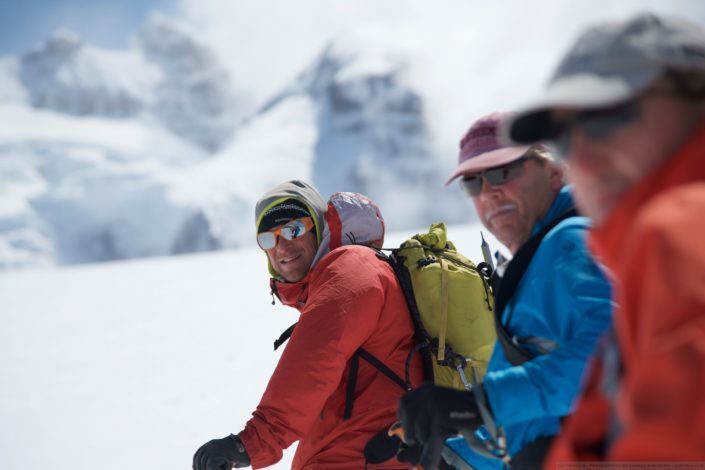 In addition to being a certified ski guide extraordinaire, his people skills, sincerity and professionalism combine for a guaranteed great adventure. In 2015 we road tripped with Jorge to several volcanoes in Chile. Jorge works tirelessly to ensure his clients are enjoying the adventure, including the apres ski which meant many a hot spring or hot tub. Again, his local knowledge and familiarity with the local proprietors made for a culturally rich and authentic experience. “I am currently travelling the world on a sabbatical, looking for amazing experiences. During a stop across south america, I wanted to rock climb in the Frey national park, near Bariloche. I found the Andescross team on the internet, and they teamed me up for 3 days with a world class guide instructor. I am a novice rock climber, and my guide Luciano not only provided me with amazing climbing coaching tips, but allowed me to push myself to go beyond my comfort zone, in all safety. 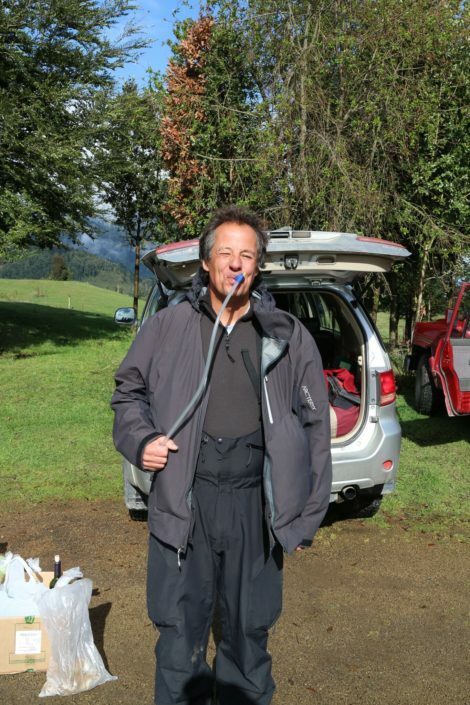 And once the climbing was over (once summits were achieved and I could not feel my forearms anymore), it was time for some of the best hospitality I have found on the road this last year. Great dinners, food, friends and laughter to fill our evening, until the call of the rock would get us out of our sleeping bag the next morning. The “ring leader” of this outfit, Jorge went out of his way to find a perfect fit of a guide for delivering a true world class experience. Many Thanks Jorge! I am looking forward to visiting again Bariloche in the years to come. Could not recommend more highly. “We would also like to thank you, for all the work you did for us on this trip. The service you provided was outstanding. So much better than what we received a year earlier from another company. 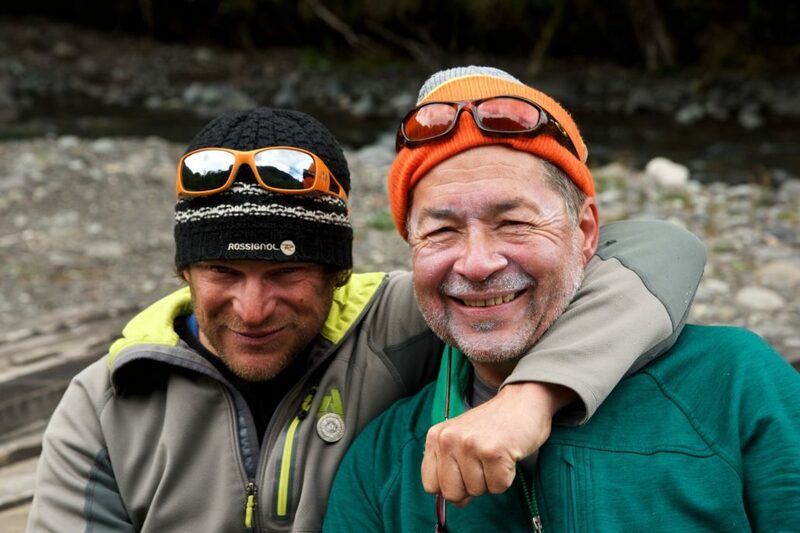 Edwardo & Louis are spectacular guides and friends. They never failed to meet our expectations, more often they exceeded them in fact. We can’t say enough kind things about them. 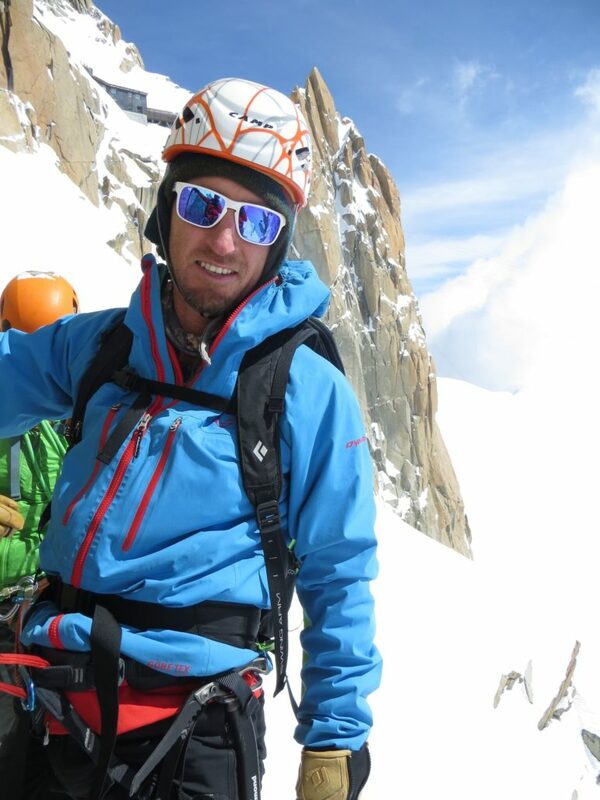 This is a Testimonial on behalf of Jorge Kozulj of Andescross –Mountain Guiding Patagonia. Brian climber from CanadaI had the pleasure of meeting Jorge in December 2008. My wife and I were in Bariloche, on holiday in Argentina. Jorge had been recommended to us by a climbing friend back home in Canada. 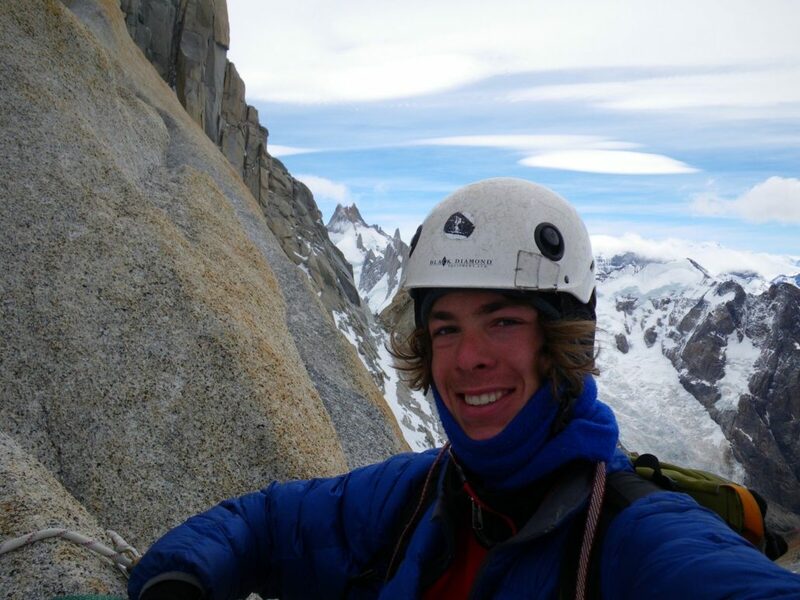 I was able to contact him by phone and we worked out a rendez-vous at the Refugio Frey for a day’s climbing on the rock. His knowledge of the area and the realistic time needed to complete various options, made it easy for me to reach a decision. What followed was one of the best days in the mountains that I have experienced over a lifetime in the sport. “Hi Jorge, It’s been incredibly busy since returning to the states. But it is still very clear in my mind the awesome experience we had biking with German. He taylor made our ride taking into consideration our needs throughout the day. The river valley is absolutely stunning and so was the service we received. German is kind, informative, attentive and, as a bonus, fun to look at! Lunch was super…we were well fed and felt like queens with all the culinary delights he prepared. 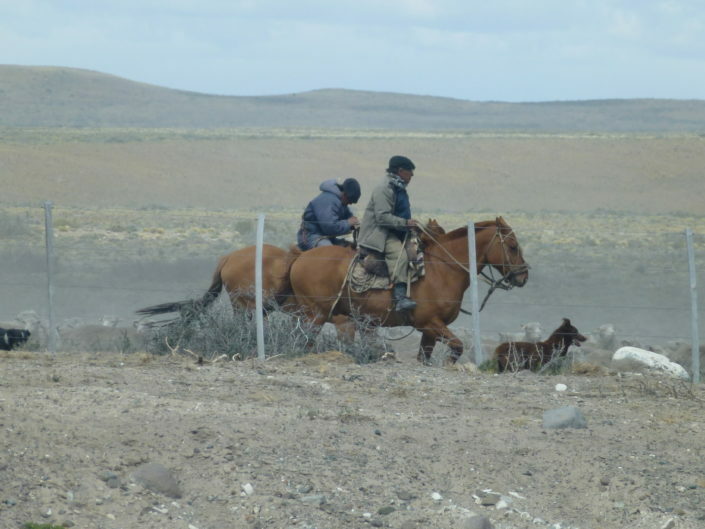 Next time to Patagonia I will be better prepared for longer rides and you can be sure that I will choose and recommend Andescross for many outdoor excursions. Thank you again! You’ve done a wonderful job with your company and all your adventures.” Sincere thanks. “Hard to believe that yesterday I was there and today I am home. There is laundry spilling out of every room, an empty refrigerator, mail to open, work waiting at the office, dogs looking at me to take them for a hike, dinner to figure out for tonight and no Lucas saying, “Sue, would you like some tea?” …..see below! So, before life moves on at the speed of light, I want to tell you both some thoughts that there was not time to say when we left. First, a great trip- a magical trip. There hasn’t been enough time to think about all the beauty that my eyes beheld. Right now I am looking at the framed photo of Cerro Torre that Dave took last year (I never tire of looking at it) and can’t imagine how to sort out all the new images from this trip. So spectacular! I am afraid that I will have to sneak out of bed each night to go to my computer and look at the pictures again and again and again. 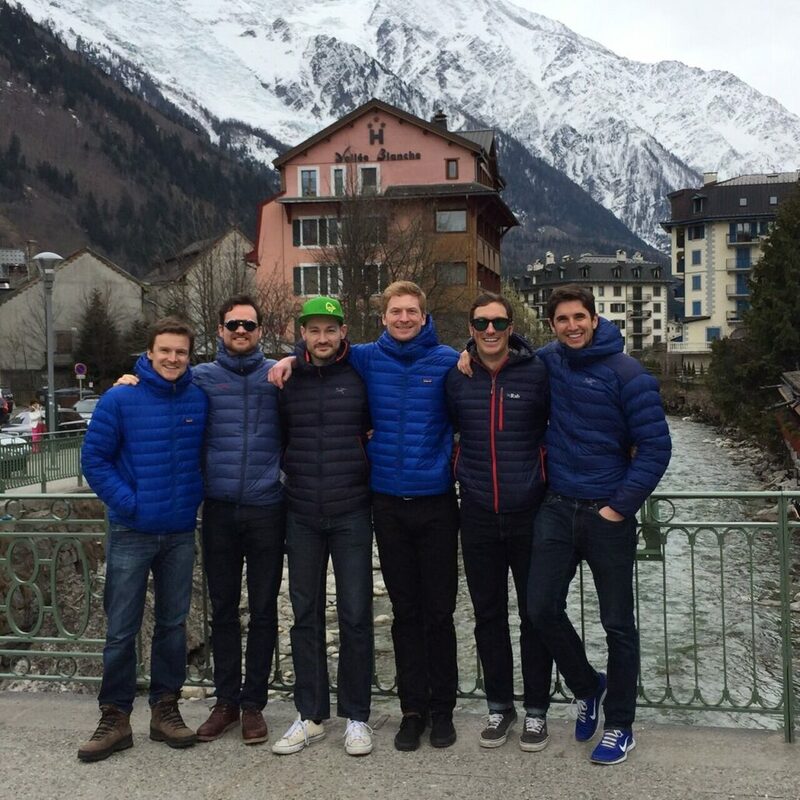 But there was something different about this trip that made it even more difficult to leave…. “So, my South American brothers, I miss your smiles and hope that you have many safe and wonderful travels that bring you peace and fulfillment”. 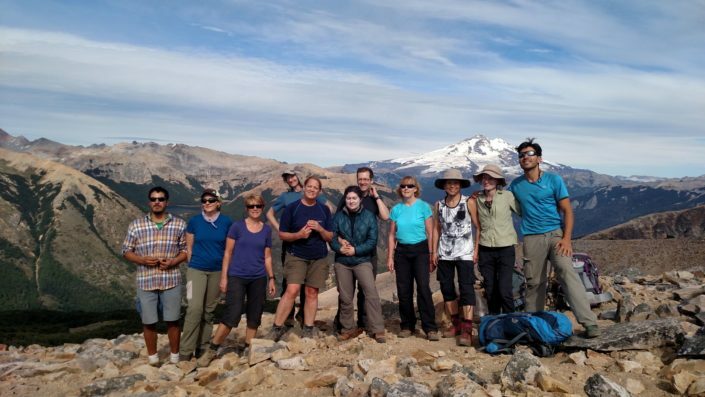 “I just wanted to say a big thank-you for the trekking trip – it was really well organized, with a fantastic route, good food, good company, and it certainly did not feel like a mass-produced tourist trek! I have really enjoyed my time in Bariloche, and will be sure to come back again…..when? I just don´t know. 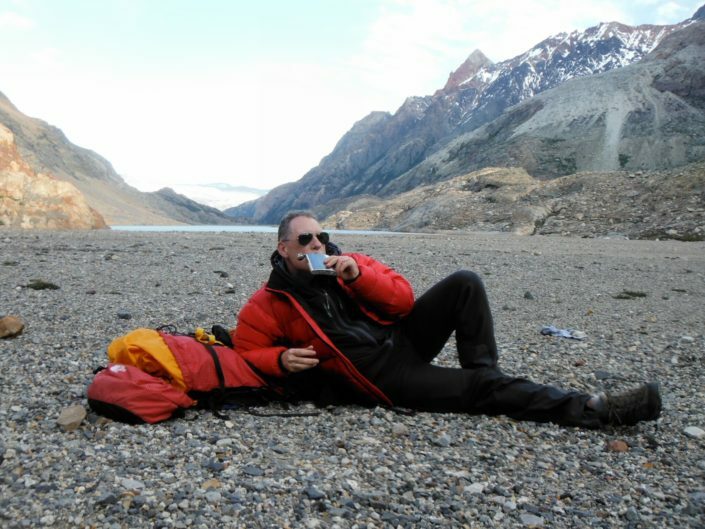 “Again, the trek was totally wonderful. The experience truly exceeded our best hopes for the trip. We really appreciated your guidance: you picked a spectacularly beautiful route that was just the right physical and technical level for us. We felt a sense of accomplishment each day and at times were stretched, but never overwhelmed. We felt safe but not over-guided. And it was really great to get to know Jorgito. Both of you were fun and it was enjoyable to spend 5 days with the two of you. And I don ‘t know how many people I could say that about! I found Andescross on the web and got a very warm, fast and informative response from Jorge. 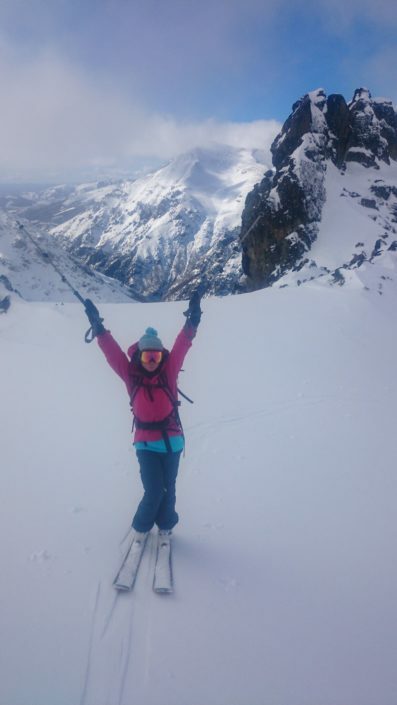 Since then I have been on two ski mountaineering trips with Jorge including a section of the Haute Route from Chamonix and a three week expedition to Patagonia where we climbed 3 ski peaks including a life changing experience on the South Patagonia Ice Cap. What I liked about Jorge from the start is his passion for what he does and his love of the mountain environment in which he is blessed to work. Mountain guiding is an extremely hard profession – you are “on duty” all the time in the mountains because weather and terrain can constantly challenge the group and the guide and necessitate continual risk assessment decisions. If anyone reading this has ever doubted the value of an experience guide like Jorge, then you have not been scared enough on a mountain – I have, and when it happens you realise that these guys quite simply keep you alive if the going gets tough. The guide also has to quickly understand his clients skills and fitness levels and juggle all these factors in the often difficult conditions. Jorge is an excellent guide because he does all these things with a positive, happy disposition and great humour. Communication skills are also really important and he will often confer with the group to explain risks and options that are ahead – getting this communication right, as Jorge does, means that the mountaineering experience is much more bespoke and rewarding. Here’s the bonus – he also liked the Pink Floyd on my i-phone, which passed quite a few hours on the 20 hour drive across Patagonia! We were a group of 4 in Patagonia, who did not know one another beforehand and got on extremely well. Jorge planned the expedition well, always taking a cautious approach to safety and ensuring food and shelter was sufficient. Up on the wilderness of the ice pack it takes a minimum of 2 days for help to reach you on foot if there is an accident (no helicopter help) – a cautious approach is important! Jorge is very focussed on flexible client service – always checking whether you are happy with equipment, accommodation and food options. 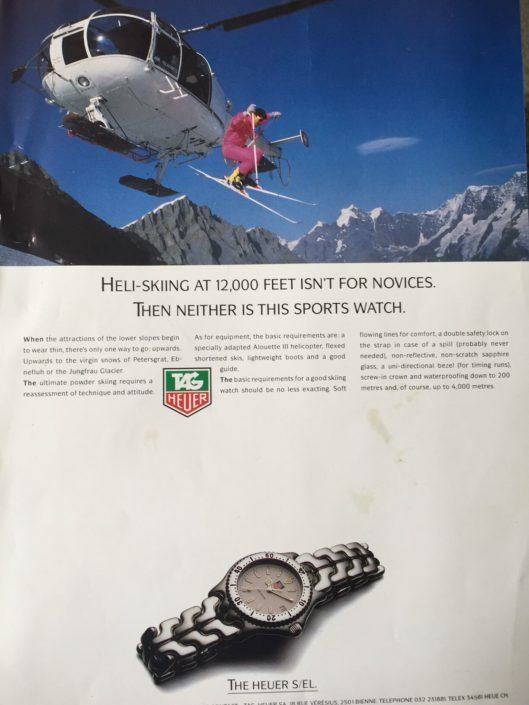 I have been skiing and mountaineering for about 30 years and have been out with a number of guides over the years. I would wholeheartedly recommend Jorge – he is an excellent guide and a great person who I now regard as my friend! The Andescross family comes back to Southamerica with us and also to Antarctica, Norway, Iceland and the Alps for more good times. This trip proved to be nothing short of fantastic. Jorge was professional, friendly, knowledgeable of the area we were traveling through and was a great travel partner. He took care of my travel arrangements in Bariloche, booked my room for me before and after the trip, and even picked me up at the airport. The next year, I returned for a volcano ski trip with Jorge. We were fortunate enough to ski from the summit of four volcanoes. In the last decade, I have traveled with him at least 8 times. 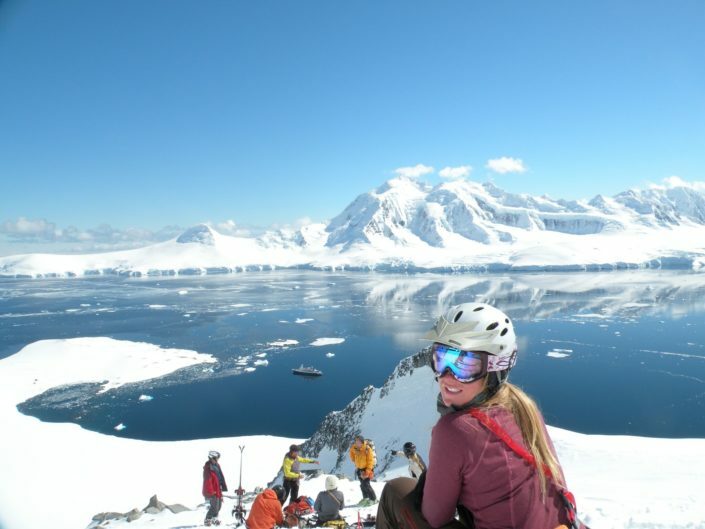 We have skied in Chile and Argentina numerous times, including a trip to the Patagonian Ice-fields. In my view, I think it would be very difficult to find another South American based guide with comparable years of experience in the Andes, guiding credentials, and local knowledge. 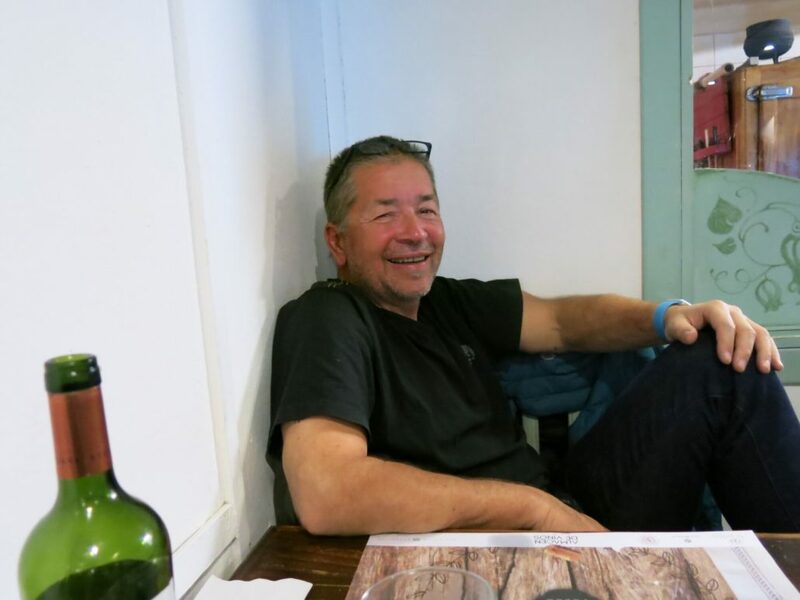 Over the years, Jorge has gained significant knowledge of the Alps and many other mountain ranges in the world which he includes in his worldwide adventure trips. He is able to quickly gauge conditions, make safe decisions, and find great untracked skiing. Hemos compartido muchas aventuras juntos en varias partes del mundo como los Alpes, Bariloche y Chalten, y siempre regresamos de cada viaje pensando en el próximo. Para que un viaje sea exitoso tiene que tener su cuota de riesgo y cautela, algo muy difícil de lograr pero que Jorge siempre ha sabido manejar. Seguramente les quemara la cabeza hablando de… Paciencia estimados clientes! !, nadie es perfecto. 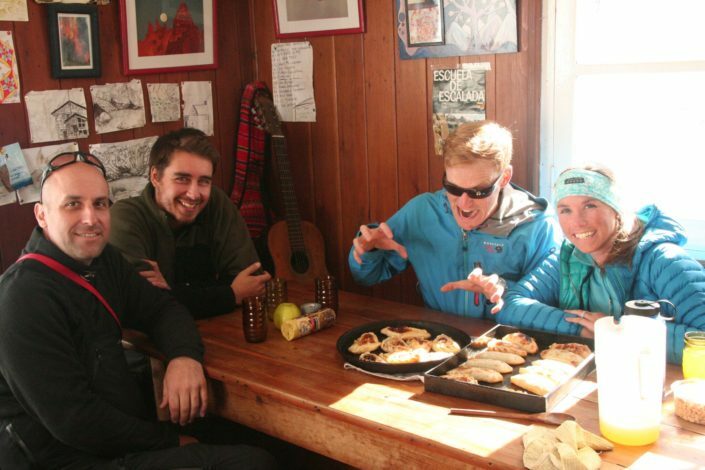 Our first trip with Jorge in 2010 was for backcountry skiing around Bariloche, Argentina. While we were temporarily weathered out of higher terrain due to high avalanche danger from tons of new snow, we never lacked for fun, challenging, and noteworthy alternatives. He shared with us his hometown stashes, something only a generous local guide could do. Jorge is a consummate mountain guide. He is completely client focused. He is a first rate professional. We trust his judgement, thrill in his ski adventures, and have been blessed to enjoy the beautiful outdoors around the world with him. 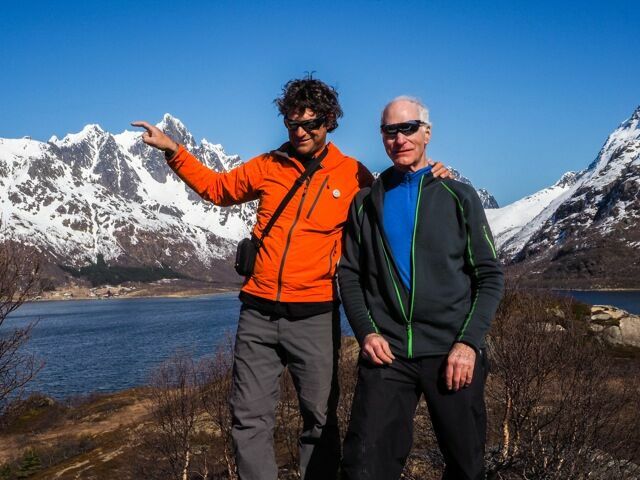 “40 years ago I flew down to Argentina in my summer for downhill training in the Andes. From Bariloche to Puerto Frias for our group of 10 people, and guided us safely along the route. He and his guides were exceptionally competent, knowledgeable and professional, and everyone had a great time. I would highly recommend Andescross! I found the Andescross team on the internet, and they teamed me up for 3 days with a world class guide instructor. I am a novice rock climber, and my guide Luciano not only provided me with amazing climbing coaching tips, but allowed me to push myself to go beyond my comfort zone, in all safety. And once the climbing was over (once summits were achieved and I could not feel my forearms anymore), it was time for some of the best hospitality I have found on the road this last year. Great dinners, food, friends and laughter to fill our evening, until the call of the rock would get us out of our sleeping bag the next morning.